Susan is the carer for her partner Grace who is 82. Grace has become increasingly frail and, following hospital admission and rehabilitation, has agreed to a trial three months in a care home. This case study examines the impact of going into a care home on the caring relationship, and the need to support transitions and respond to family conflict, including through mediation. It also considers issues of identity and sexuality. Susan is 70 years old. She is primary carer for her partner, Grace, who is 82. In their younger days Susan and Grace travelled widely, they had a large network of friends and although they don’t have any children of their own, they have nieces and nephews. Susan is particularly close to her nephew Graham. Grace has generally taken the lead in decisions and in the relationship. Sometimes now she gets angry with Susan if she doesn’t do things the way Grace expects or if Susan makes a suggestion which Grace sees as ‘stupid.’ Grace’s family have at times struggled with her sexuality and while her relationship with her nieces and nephews is good, her relationship with her brother Clive has been more difficult. Over recent years Grace has become increasingly frail and has relied on Susan to wash and dress her, support her to use the toilet, as well as maintain the home and cook meals. Two months ago, Grace had a fall and was admitted to hospital. She was discharged to a rehabilitation bed in a care home. Before the hospital admission Susan and Grace were not in contact with services. Whilst in hospital and the care home, Susan has visited every day and helped Grace with personal care. Grace frequently phones and texts Susan. After six weeks of rehabilitation, Grace continues to need support to walk and with all her personal care, including support at night. You have been involved in a multi-disciplinary assessment which has recommended that Grace needs 24-hour care. As part of this assessment, Susan talked about how exhausted she is, and said that she no longer feels able to support Grace at home because of the impact on her health. Grace has agreed to a trial three months in a care home. Susan and Grace are not legal partners, as they have not entered into a civil partnership nor are they married. Susan has no power of attorney for Grace. Susan is worried about the costs of a home and how this will be paid for. She feels guilty about ‘letting Grace down’ and sad about the future she will no longer have with Grace. Susan is also worried about Clive’s reaction. Susan has asked to speak to someone about her concerns. You meet with Susan and do an assessment and support plan. It depends on their politics! I am a human rights activist, a peace campaigner and environmentalist. My friends admire the strength of my life-long commitment to socialist principles. Don’t make assumptions about me. Read the notes before meetings or discussions so that I don’t have to repeat information. Give me information and advice on how to find and finance the best possible care for my partner. We need open-minded communities. Be aware and sensitive to us as a lesbian couple. Recognise that I am still a carer even though Grace is in a care home. Help me to carry on caring for Grace and to manage the impact for Grace and her family of her being in a care home. Support me to understand the implications for our home, finances and future decisions as we are not civil partners or married. 01.06.45 Susan born Second of two daughters, brought up in West London. Father a teacher, mother a seamstress who went on to also train as a teacher once the girls were at secondary school. Susan and her sister attend a local grammar school for girls. 22.09.65 Grace and Susan met at University, Susan an undergraduate and Grace a doctorate student, both in the politics department. Became firm friends and travelled together during vacations. 24.12.69 Grace and Susan become a couple They decide to plan a life together of political activity in various parts of the world. Both active in the women’s liberation movement and members of Amnesty International, which Grace had been involved in since its foundation in the early sixties. 18.04.73 Having worked and saved for several years, Grace and Susan set off travelling with the intention of working on their travels, volunteering and then seeking paid work. As the higher earner during these years, and with a small inheritance from an aunt, Grace bought a small flat which was rented out whilst they were travelling, enabling Grace to pay off a substantial part of her mortgage. Grace and Susan spend time volunteering in South America and then travel north to USA and Canada. They become active with Greenpeace, founded in Vancouver in the early seventies, and remain in Canada for some years. They save hard in order to travel again, remaining active in the promotion of global sustainability throughout their travels. 22.11.94 Grace and Susan decide to return to England, with the intention of seeing more of their families, though they also plan to travel regularly throughout their retirement. They decide that they will be more specific in telling their families about their relationship. Grace retired though Susan carries on working having found employment in England prior to their return. Grace sells her flat and buys a larger house in order for them to set up home together in England. Susan carries on working, the couple living off of her earnings. They continue with campaigning and maintain their international networks, socialising both at home and abroad. 29.10.05 Susan retired. The couple enjoyed their shared retirement for five years during which time they travelled on their savings. 2010-2015 Grace becomes increasingly frail. Although both Grace and Susan regret that their shared retirement is now not what they had earlier enjoyed, they have built up local networks of friends with shared political interests, which Susan continues to enjoy. Susan also enjoys seeing her nephew regularly, Graham, who lives nearby. The couple stop travelling and Susan increasingly takes on the day to day care of Grace. Susan enjoys her walks with Graham as this is the little exercise she now gets as Grace has become housebound. Grace is more and more frustrated at her growing lack of independence and immobility, and becomes more irritated when Susan does not do things the way that she likes them to be done. 13.01.16 Susan finds Grace on the living room floor after a fall at home. Grace admitted to hospital with a suspected shoulder fracture. 15.01.16 Initial medical assessments, physiotherapy and occupational therapy assessments. 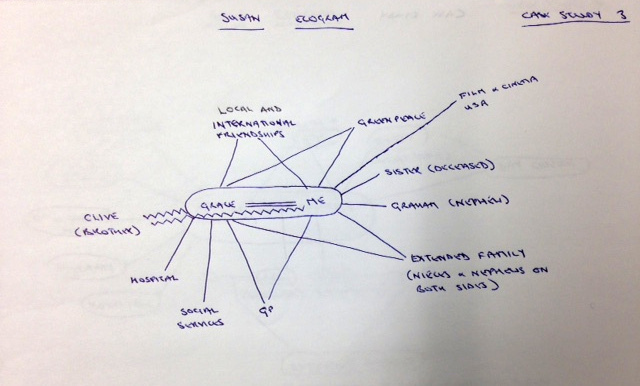 Information gathering by medical staff from conversations with both Grace and Susan. Hospital staff recommend that Grace should not be discharged home as she currently requires 24 hour care. Concerns include significant loss of weight, increasing risk around the home and that Susan is finding it hard to cope. Hospital Social Work team referral for assessment made. 21.01.16 Hospital SW assessment. Grace agrees to go to a step-down bed for up to six weeks for reablement. January and February 2016 Grace receives reablement service, including physiotherapy and occupational therapy. Some improvement in Grace’s mobility and slight weight gain. Specialist social work, physiotherapy and occupational therapy assessments completed for Grace. 15.02.16 Multi-disciplinary meeting with Susan and Grace Grace still requires significant support day and night. Grace and Susan ask for time to discuss what they will do. 22.02.16 Further meeting between Grace, Susan and the professionals. Grace agrees to go into a residential care home ‘for a trial period’. This will be LA funded. Susan and Grace both very upset. 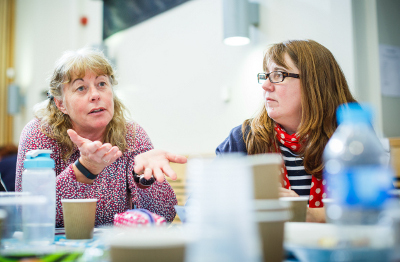 25.02.16 Susan phones the social worker from the multi-disciplinary meeting. Susan talks about how difficult the decision was, how anxious she is about Grace, her concerns about money and the house. Susan wants to know how she can support Grace and how she will cope without her. SW agrees to meet with Susan to do a carers’ assessment. 01.03.16 Further meeting with Susan. Carer’s assessment and support plan completed. 08.03.16 Paperwork completed. Sent to Susan. Phone calls from nephews and nieces. Grace is currently in a residential care home for rehabilitation after being in hospital. Before Grace went into hospital, I used to support her throughout the day and night. Now I go to the care home after breakfast and stay until Grace goes to bed. Grace often rings me when I am not at the home including in the night. I launder Grace’s clothes and bring them in – Grace is meticulous about her appearance – very stylish. I take Grace to the toilet during the day – she needs support to be able to use the toilet and it is important to her that I do this. I remind Grace about her medication and help her to take the correct ones at the right times. Grace likes us to watch films or TV recordings together, especially documentaries. We usually manage at least one programme a day together. She likes me to keep her informed about what’s going on in our political networks. I bring in books and local information, international news items, and read to Grace. I try to find things that interest her to bring in every day. I help Grace to get undressed and showered in the evening – she likes to feel fresh at the end of the day. When I get home, I sort things out there and get things ready for visiting the next day. Helped Grace to get washed and dressed in the morning. Did all the shopping, meal preparation and cooking – Grace is a good chef and explained how things need to be done. Arranged Skype calls with friends for Grace. Helped Grace to have a bath each evening – we don’t have a shower. Helped Grace to the toilet in the night, usually a few times. Fetched things for Grace in the night if she wasn’t able to sleep. Arranged any medical appointments and collected medication. The last year or so has been very difficult. I have done my best to support Grace and this has gradually made me more and more tired. I have been feeling unwell due to the lack of sleep and am always exhausted. I worry about letting Grace down but I cannot do all that she needs me to do at home. Even with help coming in, there would be so much time when it was just me. Grace has said that she will try a care home and I think this is best. However, I feel guilty every time I leave her. Even while Grace has been in hospital, and now in the reablement home, I seem to be as busy as ever. Grace is anxious about being in the home so I visit every day. The food is definitely not up to Grace’s standards – so I try to prepare something fresh to take in for her every day. Grace phones or texts me when I am not there and sometimes during the night. It is very stressful being ‘on call’. She forgets that I may be asleep or driving to see her. I used to like going to the cinema and I wanted to get involved in a “University of the Third Age” group which I saw is exploring the history of film. I would like to travel and carry on with campaigns. At the moment I am too tired to do more than visit Grace and I don’t want to let Grace down by not being there for her. It feels like my future is very bleak. We were planning to do so much more but all that has faded away along with Grace’s health. I feel like I have already lost her in a way. I miss the relationship that we had. Grace gets frustrated and she can lash out with her tongue. She gets quite angry if I don’t get it right. I know she doesn’t mean it but it does hurt and I don’t know who to turn to. Some of the staff in the home seem quite uncomfortable around us and some have made comments that I find quite oppressive. My sister passed away last year and I miss her. Grace’s brother, Clive, is hard work – he’s very domineering. I’m concerned about his response if the decision is made for Grace to go into a care home for good. He has always expected me to cope no matter what – his attitude is that I’ve ‘made my bed and must lie in it’. He expects me to continue caring for his sister as “that’s what I would have to do if I was Grace’s husband”. I have a very supportive network of friends, we phone and email a lot. The trouble is we are so spread out, and I don’t really like talking about Grace behind her back, certainly not about the more private side of our relationship. I used to relax by walking, watching films, reading, studying or visiting new places. My nephew, Graham – he only lives 20 miles away – he and I used to enjoy long walks together and we’re very close. He phones often and we make plans but I am so busy trying to sort everything out I hardly see him now. The GP is very good and comes when we need her, but there is not much she can do either now, it’s the staff at the home who are looking after Grace at the moment. Some of the staff are very supportive. I know I can no longer provide the level of care that Grace needs and it is right for her to be in a care home. However, I can’t help feeling that I have failed her. There were so many things that we shared and we had plans for the future. I’m beginning to recognise that some of the feelings I have are bereavement – the life we once shared is coming to an end. By the time evening comes I feel emotionally drained. I feel like I can’t ever switch off from thinking about Grace. My life is on hold and I miss the things that I had hoped to be doing now, being more active in the world. I have had to give up a lot to support Grace and it is affecting my health. I want to support Grace as much as I can and ensure that she is happy. I do need to make sure I can keep going and that I can still be me. I would like us to have time together that is not just about caring. I’m now providing personal care to my partner- our relationship has shifted – I’m not sure we feel like equal partners in life – not only from my perspective but I think Grace finds it difficult too. I’d love us to just be partners again, to have the intimacy we used to have with each other. I don’t want that side of our relationship to disappear. Grace’s brother doesn’t agree with the decisions that are being made. He has always found our relationship hard to accept, and he likes to be in charge. He has very traditional values. I want him to understand and to support us. I’d like someone to discuss my concerns with and talk things through, so I feel reassured I am making the right choices, for both of us. I must get it right. I’d like to not have to repeat my story and keep having to explain our relationship. I’d like to be able to stay over with Grace and feel free to visit when I and she want. Good communication between all the professionals. An explanation of everyone’s roles, and one person to co-ordinate it all. I’d like to know who to contact and who there is to help me. Grace needs looking after properly and professionally but I don’t know how I can pay for everything to keep our shared home going and sort out her care. Being clear about how the care home is going to be funded will help. Confidence in the paid carers doing their job properly, that they know what equality actually means. Grace to have access to the internet so that she can keep up with her interests when I am not there. I need expert professional advice about looking after Grace’s affairs, our home – which belongs to her, and our finances. Having someone to attend meetings with me, be my advocate. I don’t know how to cope with her brother’s response. I’d like help with this, and support from the family with this. Susan has been providing significant daily support to her partner, Grace aged 82, who has recently been hospitalised after a fall and had six weeks support in a reablement bed. At 70 years of age herself, Susan is struggling to cope with the physical and emotional demands of caring for her partner. Susan describes feeling exhausted and says that her health is deteriorating. Before the hospital admission Susan and Grace weren’t in contact with services. Following a six week reablement period, and during subsequent assessments, Susan and Grace have reluctantly come to the joint decision that a care home for Grace is needed due to the level of needs. Susan is determined to still be able to provide a high level of care for Grace, bringing her food and supporting her personal care, and activities during the day. Susan wants to maintain daily contact and be able to stop overnight with Grace. The impact of this decision and the pressures on Susan of trying to find a suitable residential home for Grace, sorting Grace’s affairs and their legal position, are considerable. Susan is also concerned about Grace’s brother’s response to her going into a care home. The situation is having a significant effect on Susan’s emotional wellbeing and she needs support in order to continue as a carer and maintain her relationship with Grace, and to engage in her own activities and maintain her home. 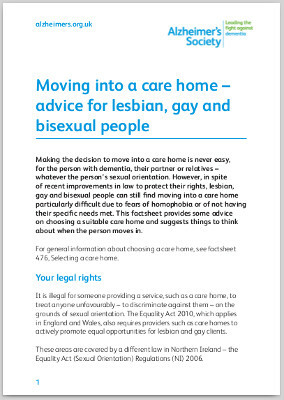 Advice about residential care home for Grace, and support for Susan and Grace through the transition. Grace receives good care. Provide information and advice on finding the most suitable residential care home for Grace. SCIE ‘Find Me Good Care’. Social worker to be named contact for Susan to contact with queries during transition. Susan is able to continue to support Grace and to be her partner. Susan continues to have high degree of contact with her partner. Grace and Susan feel supported in their lifestyle choices. As part of Grace’s support plan, Susan would like to include that she can visit regularly and support Grace in the care home, and stay overnight. This will be discussed with Grace in her planning meeting. Agree with registered manager of chosen care home that Susan is able to visit when she wants and to stay overnight. Agree with registered manager of chosen care home that Susan and Grace can book the family room during the day. Fewer demands on Susan, both physically and emotionally. Less stressed. Susan feels that she is still doing her best for Grace. Social worker to provide information about the carers’ centre and internet forum for carers, also the LGBT carers’ group. Good communication with the care home Susan is confident in the care that is provided. Named person for Susan to talk to at the chosen care home. Social worker to talk to registered manager of chosen care home about equality issues. Susan to regain a sense of own identity other than as a carer. Has time for walks and visits with her nephew. Has the opportunity to take up interests. Grace is able to carry out some activities without Susan. As part of Grace’s support plan, consider the activities and social interaction available at the care home. Susan to talk to Grace about installing wifi in her room so that Grace can access internet – a one-off carer direct payment can be made for this if Grace is in agreement. Family support. Family members able to work together. Signpost to assertiveness course via the local women’s centre. Referral to women’s centre for advocacy. Financial security, security about housing and future decision-making. Able to remain in their shared home. Susan has Lasting Power of Attorney if this is Grace’s wish. Susan and Grace have each made a Will. Financial assessment team to see Susan and Grace. Social worker to provide information about financial advisors and arrange a referral for a financial advisor of their choice to visit Susan and Grace. Social worker to provide information about solicitors and arrange a referral for a solicitor of their choice to visit Susan and Grace. Susan has asked for this support plan to be considered as part of Grace’s care and support plan but for it not to be shared with Grace. Evidence shows that hospital social work is reported as highly valued but with carers feeling that empowering and person-centred practice was sometimes undermined by the discharge and care management processes (McLaughlin 2016). 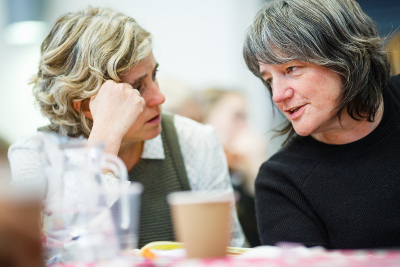 Issues of information for carers, their expectations of a social worker who has to move on to the next patient and the difficulties of reconciling the role of carers and the rights of service users – which can be at odds at the point of discharge (Fowler 2009) – are raised. 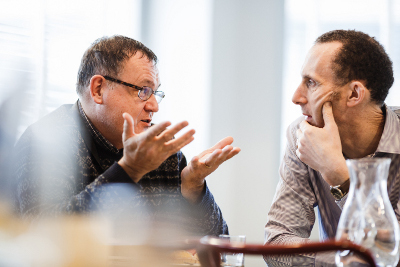 Guidance for health and social care professionals on the transition from hospital settings to the community or care homes (NICE 2015) stressed the importance of shared information (with carers if the patient consents), communication and multi-disciplinary care planning. Research highlights three characteristics of social workers in hospital discharge settings – first that they managed unanticipated events, second they made good use of a broad and interconnected perspective of the health and care system plus third, relationship building between patient, caregiver and health and care providers was an effective component of that social work (Fabbre et al 2011). Research points to contributions of social workers to care transitions, specifically, informational continuity; patient-health care professional relational continuity; conflict resolution; mediation among family, patient, and health care professional (for example, doctors and nurses); collaboration with family caregivers and community supports; and relocation counselling. Research shows that in situations of multiple and complex needs the distinction between client and carer blurred and could change circumstantially. The question of separate social workers for people in such relationships (Swetenham et al 2015) or the introduction of a carers advocate (SCIE, Care Act 2014) have received consideration. Family group conferencing, along with mediation as whole family approaches, were found to have particular applicability to adult safeguarding social work. (SCIE 2012). The significant potential of social work to ensure sustainable and effective support over the longer term, in forming relationships and undertaking comprehensive and sensitive assessments in partnership with (older) people and their carers has been documented. (Milne et al 2014 in making the case for gerontological social work). You can use this tool to consider a transition point in someone’s life. Where are you now? Where are you going? What is the reason for the journey? What are you taking with you? What else do you need? The life course model outlined in this report comprises five core elements; place, transitions, catalyst for change, personal resilience and control and enhancing future life choices. This tool sets out the stages of a mediation process. You can use it to plan and deliver a mediation session. The mediator manages introductions, clarifies the process, establishes ground rules and confirms their role. They will make sure that all participants have signed the Agreement to Mediate, which sets out the terms and conditions of mediation. The mediator will ask each participant to explain why they have come to mediation, their concerns and what they hope to gain from mediation. The mediator will summarise this information after each participant has presented their view, to ensure that they have understood the issues correctly and to acknowledge the concerns and feelings of each participant. ensure that all issues that can be included are included. The mediator will help the participants to prioritise the issues and agree an order in which to discuss them. It may be necessary for participants to be given the chance to resolve some issues before others can be discussed. The mediator will encourage participants to discuss each issue in the order set out in the agenda. They will listen carefully for agreement on certain issues and find ways to bring participants closer on issues they do not agree on. The mediator will also encourage participants to focus on interests – what each party needs – rather than positions – what each party wants. By establishing interests that are the same or similar, the mediator will encourage participants to be creative and explore options that meet everyone’s needs and interests. Participants are empowered to find their own solutions that work. 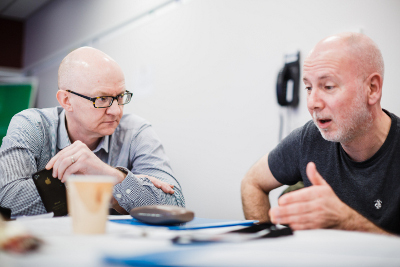 Participants work in partnership – collaborating to find solutions that are beneficial to everyone. The mediator plays an important role here: to help the participants test the achievability of the solutions they have developed. In appropriate cases, they will help the participants to focus on how their proposed agreement meets the needs of anyone – including those not present – affected by its outcome. Use our checklist to help you find out as much as you can about a care home and make an informed choice. Will visitors be able to get there easily? Are there transport links near by? Are facilities such as shops, pubs, parks and places of worship within easy reach? How accessible is the home? Will it be easy for you to enter and leave the building, and move between rooms and floors? Does the home feel clean and inviting? Do the rooms feel hot and stuffy or cold and draughty? Is there a relaxed and friendly atmosphere? Will you feel comfortable chatting and socialising in the home’s public areas? Are chairs arranged in groups or round the edges of the rooms? Is there a quiet living room for reading, as well as one with a television? Are the rooms a good size? Will you have a room to yourself? Is there any choice of rooms to accommodate preferences such as sun, shade or quiet? Do the rooms have en suite facilities or basins? Will you be able to bring your own possessions such as pictures, plants and furniture? Does the home allow pets? Will you be able to settle into the home? Would you prefer a larger or smaller home? about when the person moves in. What does it mean to be inclusive of lesbian, gay, bisexual and transgender (LGBT) people? How can you make sure that LGBT people feel actively welcomed? Why is it important to go beyond ‘treating everyone the same’? 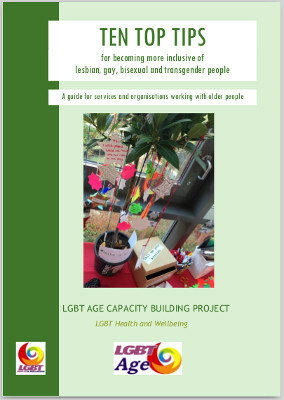 How can your organisation provide the best service possible to older LGBT people? This checklist 4 aims to assist organisations to become LGBT friendly (i.e. 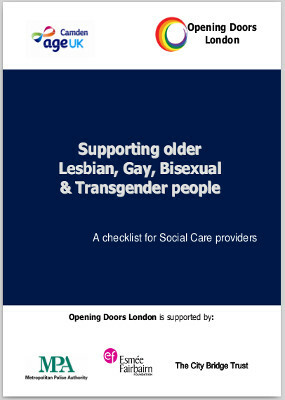 to ‘come out’ to older LGBT clients as “gay friendly”) so that the organisations more readily meet their requirements under the Equalities Act and the older person feels able to “come out” to the organisation and be fully themselves.